Dr Tam is a Diplomat of the American Board of Hair Restoration Surgery. He graduated with Bachelor of Medicine, at the University of Southampton. He holds a Certificate of Hair transplantation surgery, and subsequently passed the exams to become a Diplomat of the American Board of Hair Restoration Surgery. He is a member of the International Society of Hair Restoration Surgery and he holds a full registration with the General Medical Council with a Licence to Practice. 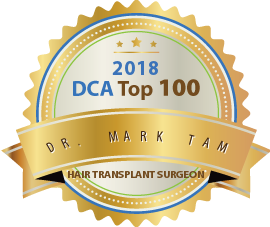 Dr Tam has many years of experience specifically in the field of FUE Hair Restoration and he has worked in various reputable clinics and private practices in London, UK and abroad. This enabled him to refine his techniques in FUE surgery, also earning him the Phideas award for his work. He has previously been a guest lecturer at the University of Lyon for the Hair Transplant Surgery Diploma course and has been a trainer for other doctors in Hair Transplant procedures. 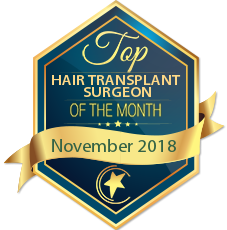 He is experienced in general Hair Transplant Surgery including facial hair, body hair and transplants into scars, but he currently focuses on his special interest: high-density Hair Transplants to the hairline and temples, an area that he specialises in and is dedicate to. Dr Tam has magic in his fingers. As a practising consultant, I know that we all want our surgeons to be courteous, considerate and professional, which Dr Tam certainly is. But ultimatley, as a patient, we want the ones with the best surgical skills. I would not allow any one else to undertake the procedures on my scalp. 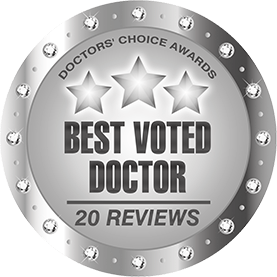 Dr Tam is that rarity, a truly gifted surgeon who stands out above the highly competent ones. It is a difficult quality to describe in a fellow doctor, but I feel we all know it when we see it, a sense the consultant is completely at one with the field. Dr Tam is meticulous in choosing and supervising his support team. The human factors interaction is clear and communication between the team is good. This leads to the patient feeling confident and supported, even through the long procedures. The support team are approachable, kind and professional and like Dr Tam put the patient at the heart of the process. References often say “I cannot spak highly enough”. With Dr Tam and his support team this actually the case. Dr Tam is an absolute professional/expert in hair transplant surgery. Not only is he one of the best in the country at what he does, he is approachable, friendly and considerate. I have referred a number of my patients to him for surgery and they have spoken of his skills and caring nature. When seeking second opinions he has been of immense help. Thank your Dr Tam for being such a wonderful doctor/human being. Mark is an excellent colleague. He provides a considered and patient-centred appraisal of hair loss. His skills in FUE are superb, as is his dedication to the speciality and his attention to providing a seamless and caring patient journey. I have no hesitation in referring patients to Mark for Hair Transplantation. I know my patients will receive an excellent service. Mark Tam genuinely cares for his patients. He strives to make sure that his patients feel looked after before, during and after the surgery. Mark Tam is a highly skilled FUE hairline specialist. He deliveres very natural hairlines in both men and women and he can lower hairlines offering a younger look to individuals . I would highly recommend him to anyone who it looking at a hairline restoration. When it comes the hairline restoration, Dr Tam is professional and trustworthy. His work is meticulous and precise. Dr Tam specialises in hairline restoration with FUE method. Being a perfectionist he’s the perfect hair transplant surgeon you can rely on. Highly recommended. Dr Tam is a caring and very conscientious and talented hair restoration surgeon. Dr Tam is an excellent hair transplant surgeon. He has great results and cares deeply about his patients. Throughout the time I have known him he has always been very polite and professional, a brilliant colleague. I have known Dr Mark Tam for many years. He is a responsible and caring doctor. He looks after his hair transplant patient well. I highly recommend him. Dr Mark has a lot of patience and is a detail oriented person. He listens to his patient’s concerns and strive to make sure they have a great hair transplant experience and result. Dr Tam is a great hair transplant doctor.He is very good at helping patients by producing natural hair lines. 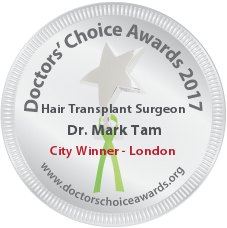 Dr Mark Tam is a didicated hair transplant doctor, highly recommended. Having been treated by Dr. Tam myself I feel I’m in an excellent position to give him a review. He is ever so friendly, has a very personal manner and is very receptive to the needs of his clients. I found him to be an exemplary example of a doctor who really cares for his patients, and if there’s any doctor that deserves this award, it’s Dr. Tam. I have known Dr Mark Tam for over a year now. His hair transplant work is excellent and precise. He is very knowledgeable, great at communicating and thorough in explaining his specialty to patients and colleagues alike. He is also very professional in his conduct and I highly recommend him. Dr Tam’s hair transplant work is second to none. Besides his skills, he is very attentive, thorough, and a great communicator. It’s always great to see when the doctor puts the patient at the heart of the consultation. In my personal experience Dr Mark Tam is a skilful & patient centred exponent of his hair transplant specialty, particularly in his ultra specialised arena of hairline and frontal area transplants. He is a credit to his specialty. Mark is a skilled hair transplant surgeon and he is an ethical guy. I know he selects his patients carefully and has his specific criteria, glad that he found an area of medicine that he is truly passionate about. Dr Mark Tam is a very dedicated hair transplant surgeon. He is passionate and confident with his job, respect his patients and has a gentle personality. Dr Mark Tam is a skilled hair restoration surgeon with all the required touch and finesse to execute the task to perfection It is always a pleasure to meet up with him and discuss our individual work passion at the Leeds branch (UK) of one of the largest cosmetic chains in the country where we share offices/ surgery/ theatres. I would thoroughly recommend him. I had referred a patient considering female patient looking for hair transplant to her hairline due to a high forehead. The results were really refine and natural looking. You wont be able to tell it is transplanted. I am pleased he gets nominated. All the best. Dr Tam is a professional doctor in hair transplant. 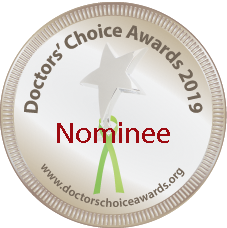 We work in different medical specialty, I support his nomination as the Doctor’s Choice Award. Having worked within the same clinic as Dr Mark Tam I can attest to his diligence, thoroughness, and constant maintenance of a high standard of ethical care. Mark is very dedicated to his work and to his patients. He is a man with great character. Hard working doctor in the hair transplant field. Has been working hard to improve the service. Good attitude and manner. Known him as a colleague in the training day. He is a good team player and can also be a good friend outside work. Having worked alongside Dr Tam at The Private Clinic in Leeds, I would highly recommend him to my patients contemplating FUE treatments. From what I know of him, he is very meticulous and precise in his manner and his attention to detail is second to none. His ethical approach and knowledge within the industry is very high and his passion comes across with each patient he treats. Dr Mark Tam is professional, ethical and produces high quality hair transplant results. I would highly recommend anyone to refer patients who suffer from hair loss or consider hair transplant surgery to him.